I did some more updating to Tesseract today after some feedback by a playtester. You can download the PC build here (WinRAR or 7zip needed). -Weapons will no longer break if you switch them before the reload is done. Simply switch back to the weapon at any time when it’s empty and it will reload. EDIT: Had a problem with the hyperlink, it’s fixed now. So on the SA forums I’ve been participating in biweekly game jams. Sometimes I’ve made stuff, and sometimes I haven’t, but this week I feel I made something pretty decent at least from a prototype standpoint. 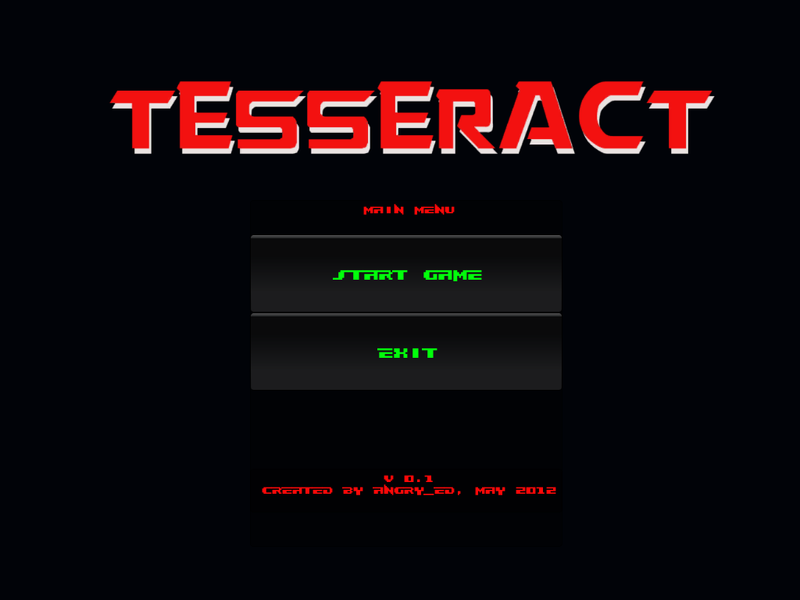 Tesseract is an FPS consisting entirely of procedurally generated levels. Currently the prototype only runs the player through 10 of them, just to get an idea for what’s going on. I made it in about a week using Unity, doing just about everything myself although most art assets and some pieces of code were taken from free resources on the Internet. What originally inspired me to create Tesseract was the idea of taking concepts from Roguelikes (randomly generated levels, one life to live, permadeath, etc.) and put them into an FPS. Along the way however I think I got a bit hung up on the FPS aspects and less on the Roguelike aspect, but I’ll get to that. Wolfenstein has not aged well, and more people have fonder memories of Doom than they do of Wolfenstein. That’s fine, I get that, but the game will always hold a place for me as teaching me what the word “pysched” meant, as well as exposing me to the wonders of the third dimension (well, second-and-a-half dimension). It also probably contributed to my desire to try and 100% games even when it’s near-impossible, thanks to that Secrets tally. …hmm…”Get Psyched” doesn’t work here does it?